Mid-winter, so time for the blue insulated bootees to come out, now reinforced with an additional layer of black foam that I found in a ditch on the Motueka Valley Highway, and I am pleased to say that these now excite admiration rather than scorn among the children's peers. At least, I think it's admiration. What happens in winter is this: you install central heating. Central heating is not applied to the house in New Zealand but to the person, by means of hot water bottles installed inside your coat. Then only your fingers fall off. The picture demonstrates the principle. 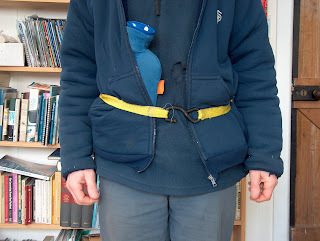 For the belt buckle I retained the black steel luggage hook, and though I do wear it to hold my 25-yr-old Point North coat closed and to secure the hot water bottle, it's also to toughen the children to embarrassment for when their friends call. Nor shall I tell you which of these three predominates. With the winter rain the children have found a new walk for their exercise; it goes up past the sewage ponds to the coast where all the wildfowlers lurk and where if you turn over old logs and look lively you can catch small lizards which promptly bite your fingers and scurry off into the grass when you drop them. 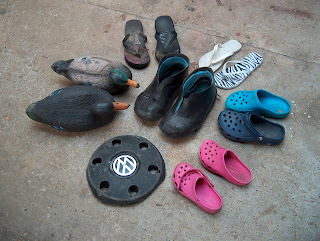 Beachcombing is only less hazardous if the wildfowlers don't see you carting off their mislaid decoys because, imbued with the indiscriminate wisdom of their father, the children return with any and all treasure as is to be found. My policy on bicycle rides is to go as fast as possible but to stop whenever I see an 8mm bolt or a penny washer on the road. My wife believes I am addicted to useless junk but she doesn't know how long it takes to machine an odd-sized penny washer when I come to need one, and actually it only costs twenty seconds of riding time to stop. Unf. the 8mm bolts are always munted and anyway bolts aren't washed up on beaches, but now I never need to buy flip-flops, nor indeed Holey Soleys provided my feet shrink a bit and I'm content to wear a bright and a dark blue one, which of course I would if they fitted. The pink ones are too small and both left-footed so if anyone chances to see twin children rather distinctively hopping down the road on their right feet, send me an address and I'll post them their missing beach shoes. And - um - you never know when you might need a plastic VW wheel hub.